The Edgewood Community Learning Garden (ECLG) is surrounded by a diverse group of homes. Driving towards the ECLG, and passing by the Edgewood neighborhoods, the background of the area can begin to be understood. Many of the houses are old, rotting, and some boarded up. However, nestled between these houses are homes that have been reconstructed to be made new and expensive. 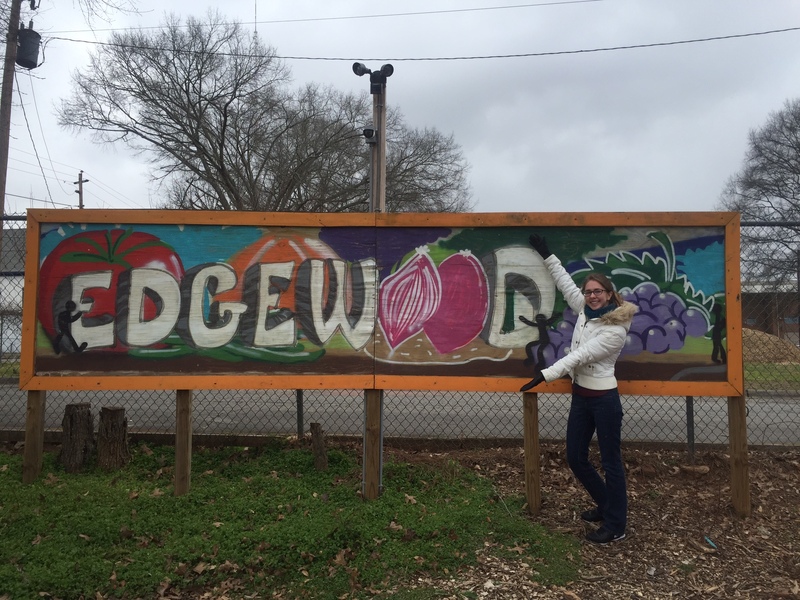 Gentrification has rocked the Edgewood scene to create an ever changing environment. Despite this transformation, the ECLG sits, surrounded by old houses, as a place of welcoming for all of the home owners in the neighborhoods— no matter their socioeconomic status. The beautiful entrance to the garden is never closed and has lovely hand painted signs on the inside and outside of the garden. 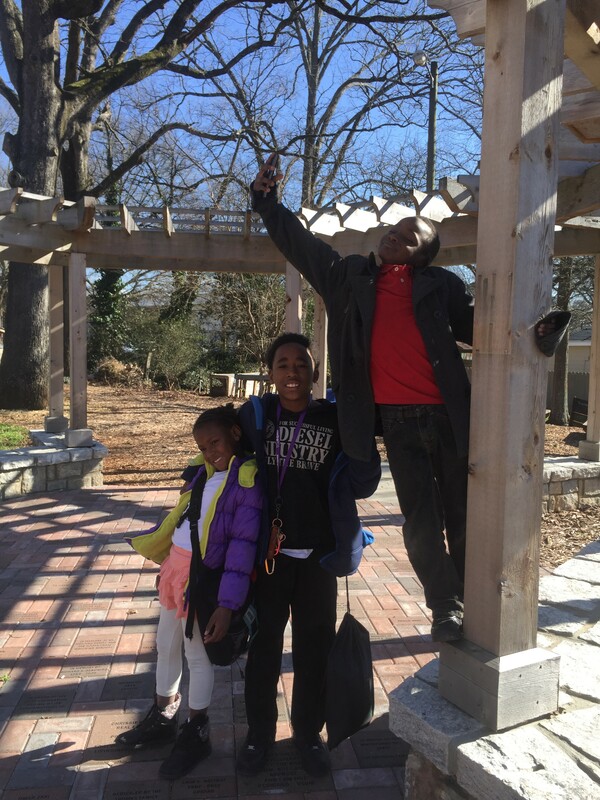 The ECLG is always open to the public to watch the chickens and honey bees, to run around on the play set, or to gaze at the fresh vegetables and blooming flowers. 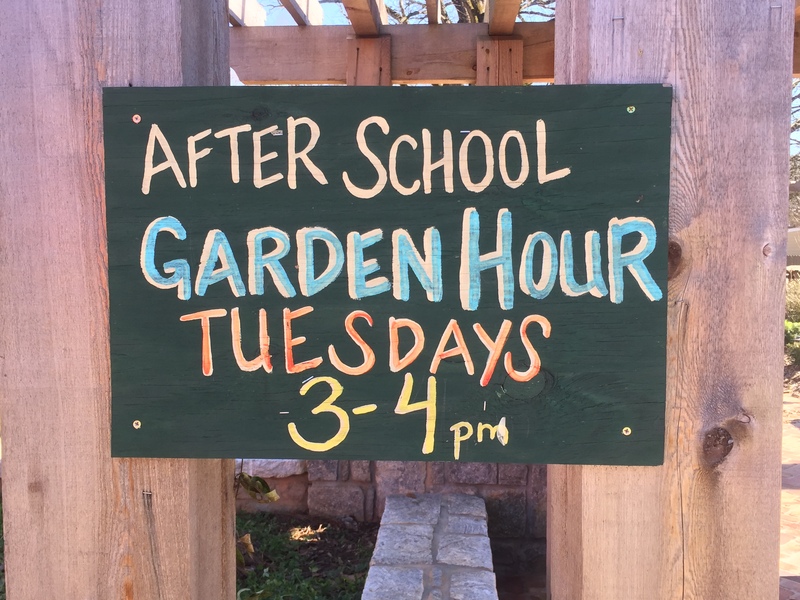 During its six years of existence, every Tuesday, the garden invites all of the children around the area to visit the garden and to learn more about how fresh foods grow, where they come from, and why they are important (http://sites.gsu.edu/sberry11/2016/02/09/external-desctription-2/). The ECLG also provides a place where all the members of the community can come together and meet with one another during the events, like the Fall Roots Festival. The greenery and colorful welcome sign make it a place of serenity and happiness. There are paths made from place to place within the garden as to encourage its visitors to walk around and enjoy all that it has to offer. A greenery full of flowers, lies at the front of the garden, allowing the honey bees to do their work. The apiary, or bee yard, is built inside of the chicken coup because the chickens eat the larva of the parasitic bugs that affect the bees. To the left of the entrance, well kept rectangles hold a diverse selection of fruits and vegetables (http://sites.gsu.edu/sberry11/2016/02/09/external-description-3/). Beyond that, is the play set where the children can release their energy instead of taking it out on the delicate plants. It is evident that gentrification is occurring in the Edgewood neighborhoods. As I drove past the homes, a modern three story home sat next to a small one story home with the windows boarded up. Taking the place of an apartment complex, it is interesting that the garden was built here. During this garden’s six years of existence, it has witnessed the demolition and renovation of many homes, becoming too expensive for the poor to purchase. On their way home from school, these curious students stopped by to talk with me. I spoke to them about what they think about the garden, and they told me they liked to look at the chickens, and there was a band that came to play here. I later learned that what they were referring to the Fall Roots Festival last November where about 100 people joined in on this community unifying activity. The vegetables grown in the ECLG are donated to food banks, and the children who help work in the garden can also sometimes bring food home with them. Upon speaking with the ECLG manager, Derek Pinson, I learned that they are planning to have a market stand set up so that the foods that are ripe enough to be eaten can be set on the stand for the surrounding community to take home with them. 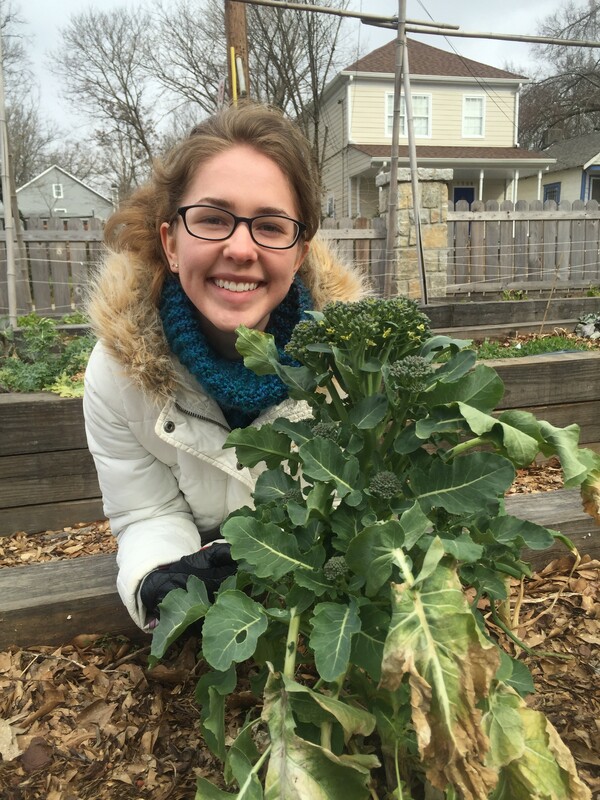 The ECLG offers a time where elementary and middle school students can learn about how to grow their own food. 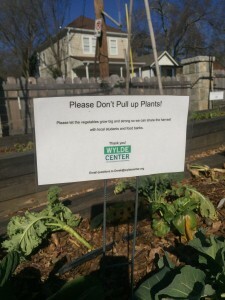 In an urban environment like Atlanta, these children may not have ever had the opportunity to be exposed to how fresh, healthy foods are grown. 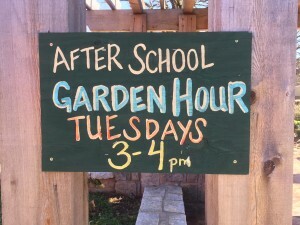 The Garden Hour gives children the chance to become educated and excited about vegetables! 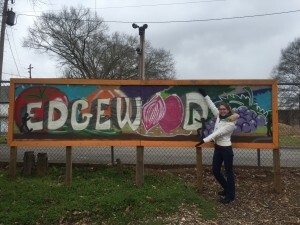 “Edgewood Community Learning Garden”. The Wylde Center. Clifton Farm. 2013. Web. 5 Feb. 2016. 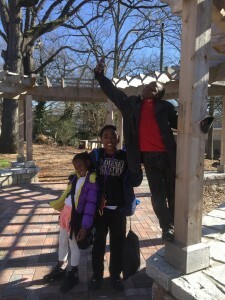 <http://wyldecenter.org/edgewood-community-learning-garden/>. It is important that I have the direct information about the Edgewood Community Learning Garden (ECLG) for this paper. I have emailed the Garden Manager to get some answers to my questions that were not posted on this site. However, this article is helpful because I now know that it has a system setup for volunteers which gives me the impression that the ECLG is easily accessible to the entire community. Having the presence of the Garden accessible to children growing up in this urban environment is important so the children can see first hand how cool healthy foods can be. I would like to know if the food grown here is available for the children to eat, because so often, vegetables are expensive and in short supply in urban areas. The ECLG has the opportunity to educate children about healthy eating and how they can grow the food themselves. 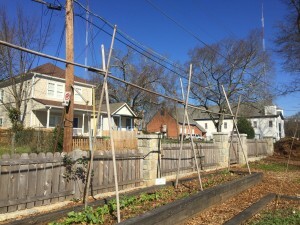 I hope to incorporate what the manager says into the paper to analyze how the garden has changed the community, who has access to it, and why it was built there.